Making my “Strong Pain Relief Balm” was more of an accident than planning. When I lived in Christchurch, a couple of years after the devastating earthquakes, I lived near hundreds of deserted houses in the red zone. I used a mobility scooter then, and used to look around the gardens of those empty houses, and kept finding myself attracted to a, then to me, was mystery plant. After a few weeks, I took some photos of the leaves, and asked on Facebook if anyone knew what it was. I learned it was Comfrey, and someone that replied to that post said it was good to make into a balm, and used for horses on sprains, gashes and new injuries. Another person on that Facebook post said chooks loved to eat the fresh leaves I haven’t found that to be true well not for my hens and ducks. While my chooks do like comfrey, but only when the leaves are mature or at the end of the growing season, not young small or medium sized leaves. Most people commenting on that post, told me about how organic gardeners used it to make a liquid fertilizer, and how once it was in your garden, you would never be rid of it. Anyway, I decided to make a balm for a fb friend with a horse, and quickly was making it by the 2litre ice-cream container for horse lovers around Christchurch. and couldn’t make enough to supply. Using a recipe I first read online and followed. I started giving small amounts of leftover balm to old homeless men I had befriended for their cracked hands and feet, I didn’t know then that comfrey had pain relieving properties, let alone how much it relieved pain, I just thought the oil and wax would be soothing for their terrible dry skin. One of the old guys broke a toe, then another one broke a finger, and they both told me how good it was for the pain, I thought they were joking, and just wanted more balm, or more they liked having something made for them and often applied for them with love. … I still never considered it could help my own pain, I needed morphine and codeine for my pain. Two years on, and living now in the North Island, one day I noticed that while making the comfrey balm, in those days with my bare hands, that my own pain was much reduced, which was odd, because generally standing for just a couple of minutes would make my lower back ache so much I would have to sit or lay down until the pain eased… Still I really didn’t take much notice, I’m so used of pain, I was just pleased the pain was reduced. Finally came the day, I was again making a brew of comfrey balm, and my sciatic nerve started hurting really badly, I was filling the 2 litre containers again with my bare hands and they were covered in the balm, and I rubbed the balm into my skin on my hip where the sciatic nerve, using it more as a lubricant, and definitely not expected anything amazing, but after a few minutes, the sciatic pain was gone. I didn’t think much about it at the time, sciatic nerve pain can be odd like that, it comes and goes without rhyme or reason. I was too tired to do the dishes after I finished making the balm, so I just left them and went to bed. The next morning I woke up and was in a lot of pain in my lower back, looking at the dishes, I groaned at the mess I had to clean up, and left them and went to check Facebook… Something told me to try the balm on my back, I thought yeah right pfff… it wouldn’t help my pain… so I scrapped my finger around the cooking pot and scaped about 1 tsp of the balm onto my fingers and tried rubbing some in, more to prove that the sciatic thing was just a coincidence. You could have knocked me over with a feather when the pain just disappeared within a few minutes, I had used way too much and had to find an old cleaning rag to wipe most of the balm off. I tried to tell myself it was another coincidence, but this was different, that pain in my lower back never |went away” even with the strong pain medications I was then using. So when the pain came back I tried the balm again, and sure enough, the pain disappeared. I started taking a pot of this comfrey balm with me, where I went and trying it on anyone that talked about pain anywhere, quickly I started getting orders for the balm, I didn’t sell many, but enough to buy more wax and oil to make more balm and a bit extra. Then one day another facebook friend suggested I make a facebook page and start selling it. I did and now the rest is history. I never reread that recipe for 3 years, and then found out I was making the balm very differently to the instructions gotta love being dyslexic. 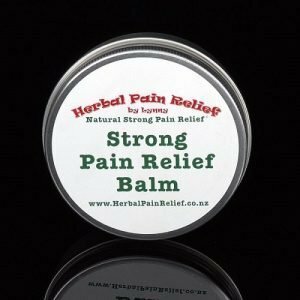 However by then, I was selling what I had renamed Strong Pain Relief Balm, and people were finding it much better than any comfrey balm they had tried, so I kept to the recipe I used. if it ain’t broke, don’t fix it huh.